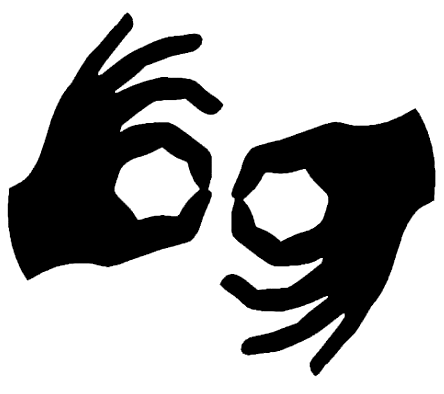 OakBend Medical Center is now offering two types of educational monthly breastfeeding classes to help new and expecting mothers prepare to successfully breastfeed their newborns. Expectant fathers and partners are also welcome to attend to learn how to provide support through breastfeeding. All classes are taught by lactation specialists from OakBend Medical Center. Class topics include: How to produce enough milk, latching and positioning, feeding frequency, what to expect at the hospital, pumping and breastfeeding management. Paid classes will take place on the 4th Thursday of every month in 2019 from 5:00 to 7:00 p.m. at OakBend Medical Center’s Williams Way Campus, located at 22003 Southwest Freeway, Richmond, TX, 77469. Classes will be held on the second floor classroom in the Labor and Delivery department. 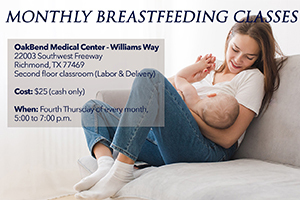 OakBend Medical Center’s Latch and Learn breastfeeding class program will be held the second Tuesday of every month in 2019 at OakBend Medical Center’s Williams Way Campus, located at 22003 Southwest Freeway, Richmond, TX, 77469. Classes will be held on the second floor classroom in the Labor and Delivery department. Light snacks will be provided. WIC and non-WIC clients welcome. For information about Monthly Breastfeeding classes, please click here. For information about free Latch and Learn classes, please click here.